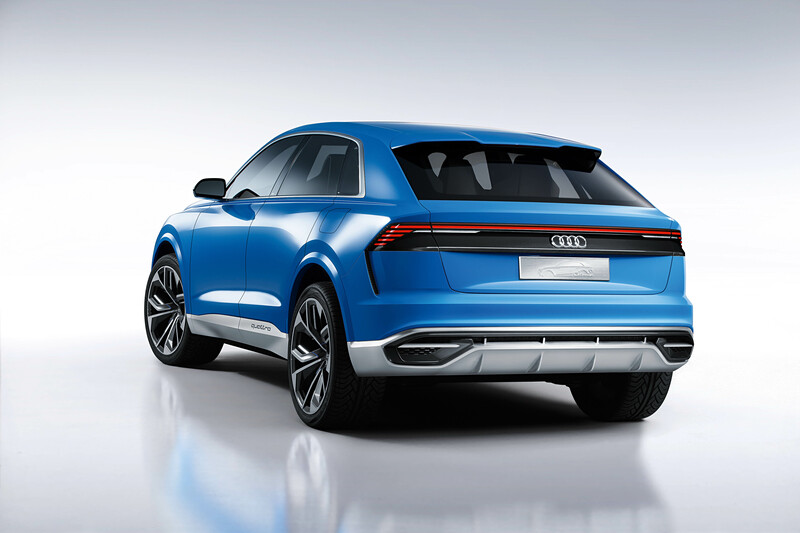 Audi has pulled the wraps off its Q8 concept at the Detroit motor show, offering a clear glimpse of what’s to come in its future flagship SUV, which is due to be released next year. The Detroit concept sports a striking exterior design that combines the large footprint of an SUV with the sleek lines of a coupé. It is powered by an e-tron-badged plug-in hybrid powertrain made up of a 3.0 TFSI petrol engine, which produces 329bhp and 369lb ft, and an electric motor. A 17.9kWh lithium ion battery is located at the rear. It gives a claimed all-electric range of 37 miles and takes two and a half hours to fully charge via a 7.2kW charger. With a full tank of fuel, the Q8 has a claimed maximum range of up to 621 miles. The electric motor adds 134bhp and 243lb ft, bringing the combined system outputs to 443bhp and 516lb ft, which is enough for the Q8 to hit 62mph from rest in just 5.4sec and go on to a limited top speed of 155mph. The concept uses an eight-speed tiptronic automatic transmission with permanent quattro four-wheel drive. It features a torque control system to improve agility by braking an inside wheel when cornering at speed. The car sits on five-link adaptive air suspension front and rear. Adjustable damping control allows the driver to switch from Comfort through to a firmer Sport mode, with the different settings raising or lowering the car by as much as 90mm. At 5020mm long and 2040mm wide, the Q8 concept’s footprint is larger than that of a Range Rover but it stands 210mm shorter at 1700mm. The car’s wheelbase is 3000mm, which is 78mm longer than that of a Range Rover, and it rides on 23in twotone alloy wheels sitting within bulging wheel arches. Much like the smaller Q2, Audi’s designers have used the arches to give the lower section of the car a more muscular stance. The wheels wear 305mm-wide tyres and feature intertwining Y-spokes. The concept also has 20in ceramic brake discs. 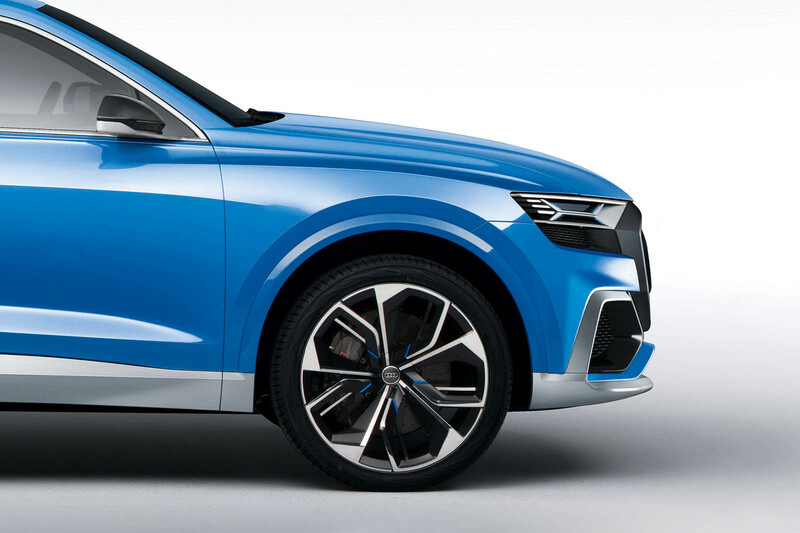 An octagonal grille, bigger than that fitted to any current production Audi, dominates the concept’s front end. It features a honeycomb pattern inlay and extends down towards the front bumper, where it is undercut by an aluminium blade. The Q8’s headlights follow the lines of the grille and bonnet and feature digital Matrix laser technology that can project one million pixels onto the road ahead. There are also LED daytime running lights, which double as dynamic indicators, mounted within the headlight cluster. At the rear, the tail-lights extend across the full width of the car and use LED technology to allow the single strip of lights to act as brake lights and dynamic indicators. Both the black trim panel that the light strip is mounted on and the car’s C-pillars are said to be inspired by the Ur-quattro of 1980. The frameless doors are opened by touch sensors that detect the presence of a hand or fingers and then open the doors automatically to a defined angle. Inside, the Q8 concept has four fine nappa and nubuck leather-wrapped seats and Audi’s Virtual Cockpit technology. The digital displays are headed by a 12.3in TFT screen that features a new design for its menus and works with augmented reality to project virtual graphics over the windscreen. Additionally, the Q8 has a 630-litre boot — 80 litres bigger than that of a Range Rover. The Q8 concept will inspire a production version that’s due to go on sale next year. The Q8 is scheduled to be built at Volkswagen’s Bratislava plant in Slovakia alongside the current Q7 and future versions of the Porsche Cayenne and Volkswagen Touareg. It is expected to have a starting price of around £60,000, £12,000 more than the existing Q7. Doesn't look like a typical SUV. Could almost be a Rolls Royce with a boot stuck on the end. It looks imposing yet sleek. Much better than the A8 which looks like a giant A4. Superb! Puts the Q2's looks into some kind of perspective. I prefer the grille treatment to the standard Q's. Not bad, in fact I like it. It's hardly ground breaking, but less generic than Audi's usual designs and more modern. One small detail that I really don't like is the small grille underneath each of the headlights, which make the headlights look a lot bigger than they actually are. I was really drawn into the slim headlight design on the prologue concepts. Hopefully they get rid of those silly little grilles as they don't appear to add anything and only serve to clutter up what is otherwise quite a clean design. And we thought they couldn't make something uglier than the A1! At last, a well-proportioned Audi! And (in profile/rear view) almost elegant. The grille - at least with these textures - is heavy-handed though. And the trouble is, it makes the Q7 (and Bentayga) look even more awkward and ungainly. Good design, just shrink the damn grill! Love the design first of having a footstep built in below the headlamps. I'm tall but for shorter people it'll help them polish the bonnet. Real ergonomic innovation!